Song is prolonged jumble of short trills and thin twitters. “Per-chic-oree” flight notes. Description: Breeding adult male is bright yellow overall with a black cap, black wings, and black tail; white wing bars, with upper bar being the widest; yellow shoulder patch. White rump and undertail coverts. 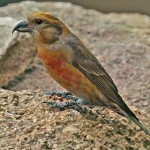 Female is duller overall; olive above; lacks black cap and yellow shoulder patch. White undertail coverts. Winter adults are even duller; either brownish or grayish above; male may show some black on forehead; white wing bars are more prominent. 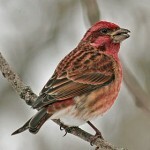 Immatures are similar to winter adults but wing bars are buffier. Behavior: Has erratic, “roller coaster” flight pattern. Habitat: During the fall and winter birds are often found foraging in fields of tall weeds. Breeding usually occurs in rather open grassy areas, farmsteads, swamps, and other areas where thistles and cattails are abundant. Where in Nebraska: Common permanent resident across the state. 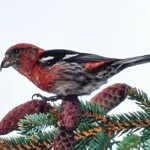 Winter populations vary from year to year. Fun Facts: Sometimes known as “Wild Canary”. 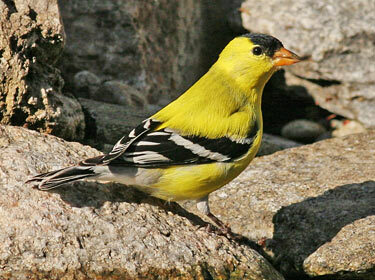 American Goldfinches are the only bird in the Finch family that molts twice a year including the breeding season.